SYNOPSIS: A moderate to fresh trade wind flow generated by a ridge of high pressure will continue to transport pockets of low level moisture over and around the islands at times during the next 24 hours, thus maintaining a moderate chance for shower activity across the area during that time. WEATHER TODAY: Partly sunny skies with locally cloudy spells and a 50 percent or moderate chance for passing showers. WEATHER TONIGHT: Fair to partly cloudy and cool conditions tonight with a 20 percent or slight chance of a brief overnight shower. WINDS: Southeast at 22 to 33 km/h or 12 to 18 knots with higher gusts over open waters..
SEAS: Gradually subsiding, ranging between 1.5 to 2.1 metres or 5 to 7 feet. 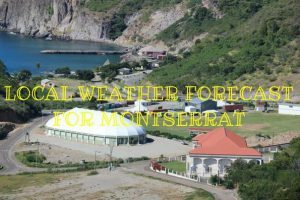 Small craft operators and sea bathers should however continue to exercise caution mainly in coastal waters east of the islands as an advisory remains in effect..